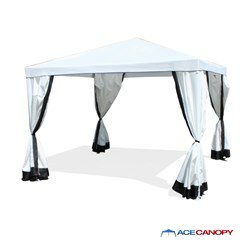 Leading canopy tent distributor ace canopy diversifies canopy tent catalog for a wider range of customers. What’s the key to attend more sales? Diversification. Leading canopy tent supplier ace canopy has decided to leave no stone unturned in its quest to offer canopy tents to the public. Temporary shelter has many applications but has been limited to higher income customers due to cost. This year, Ace canopy has decided to create of line of pop-up tents and temporary canopies that are more affordable yet look more like the expensive kind. Many customers want canopy tents for temporary use but cannot afford them. Due to the cost of heavy-duty materials, Ace is bringing out a new line of light duty framed and center material canopy tents for temporary use that still look like the higher end quality tents. Many of the canopy tent patterns were modeled after the higher end shelters, but the thickness of the fabric and gauge of the steel frames were minimized to bring down the cost. According to the canopy company, many customers only need these tents for a weekend or 2 out of the year, but would like something that looks nice but cost much less than the industrial models. The company also wanted to compete with rental companies. Many times a rental company will charge nearly 30% of the actual cost of a tent. The new ace canopy models are approximately 60% less than the commercial grade canopies. This makes owning an option as opposed to renting.